Because you follow and read Confident Parents, Confident Kids, you clearly care about the powerful influence you possess as a parent and you realize how you use that influence matters greatly. My friends, Cecilia and Jason Hilkey, have launched their third conference to share cutting-edge brain science and practical tools that parents can use to help their kids foster social and emotional intelligence and mindfulness, navigate friendships and feelings, and develop resilience. 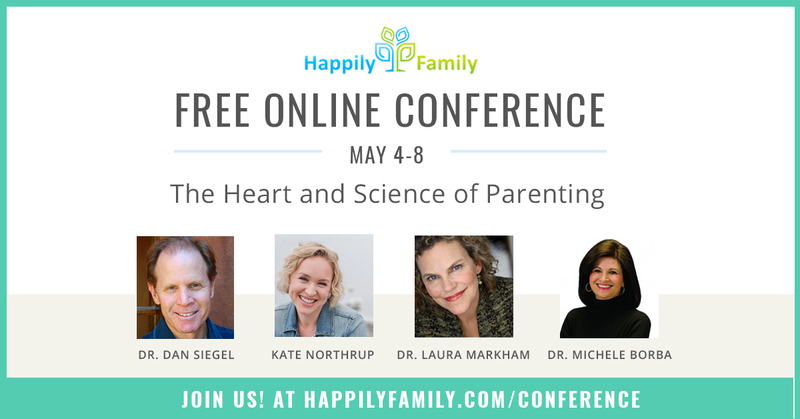 And the Happily Family Online Conference is completely FREE! Cecilia and Jason are dedicated to this work. For over 15 years, they have taught parents how to communicate with their kids. Together they’ve taught preschool, worked with children with special needs, and they have two kids of their own. There is a wealth of support, wisdom, and a global community at the Happily Family Online Conference. Visit this link so you can view the full agenda or follow this link for a simple sign in and you’re all set. I encourage you to take advantage of this opportunity to learn and grow! Oh no. There are better ways to handle situations in which you need a child to use a quieter tone of voice. She could have stooped down to his level and said in a conspiratory whisper, “Let’s talk like this.” modeling how you want him to talk and engaging him in a game of whispering. It works and sends a more important message than the one you overhead. Thanks for your comment!! !